Available Now! Contact support@openrangeaccess.com for your free download. Do you need an inexpensive and simple way to manage and centralize the backup of your ClearSCADA systems? Axs Direct SCADA BakTrak has you covered! 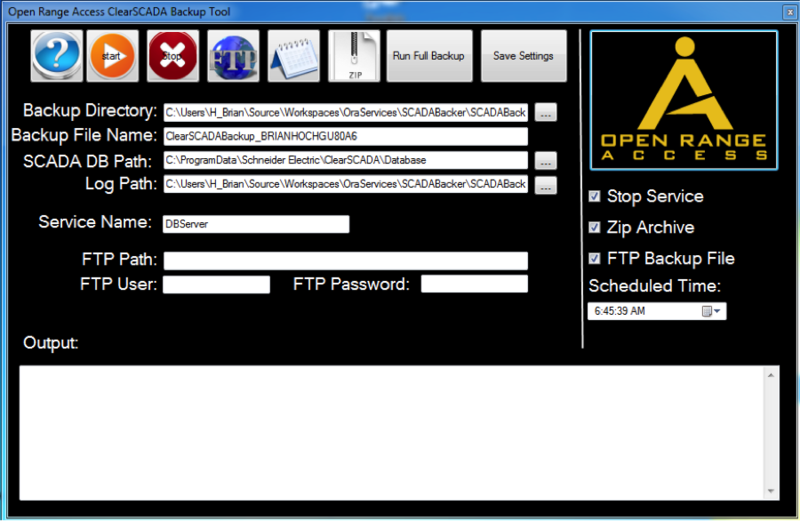 SCADABakTrak is a free windows program that you install on your ClearSCADA systems that schedules the automatic backup of your ClearSCADA database. Optionally shut down the ClearSCADA database service to ensure files aren’t locked. You can either step through the backup manually using the tool, or enter your settings and save them and the backup, compression, and ftp of your backup is handled on a scheduled basis. A major advantage of our tool is that a system administrator can configure the backup without using ViewX. The admin simply needs to have permission to stop and start the DBServer service. All the features (ftp,zip,etc) can be configured to meet your needs. You can see the documentation here.